This cute pale pink party dress features dimensional textured fabric rosettes at the bust. The Bloom and Grow Dimensional Rosette Dress is fully lined. It has a V neckline, adjustable spaghetti straps that cross in the back, and an empire waist. The attached skirt is made of chiffon and has a flowy cut. The best part of this dress has to be the bust made of fabric rosettes, giving it a whimsical and girly feel. A hidden back zipper completes this look. The Bloom and Grow Dimensional Rosette Dress would make a cute bridesmaid dress or just a pretty dress for any occasion. Pair it with beige pumps or strappy heels for your next event. Details: Fully lined. Adjustable spaghetti straps. Hidden back zipper. 60% cotton, 40% polyester. Contrast: 100% polyester. Lining: 100% polyester. Hand wash cold water separately. Color will bleed. No bleach. Hang to dry. Small measurements: Length from top of bust to hemline: 31". Bust: 32". You have added Bloom and Grow Dimensional Rosette Dress in Pale Pink into Wishlist. You have added Bloom and Grow Dimensional Rosette Dress in Pale Pink for Stock Notification. 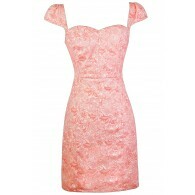 You have set Bloom and Grow Dimensional Rosette Dress in Pale Pink as a loved product. 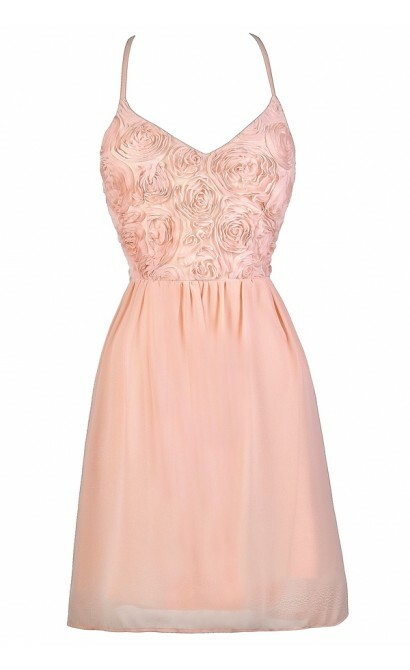 You have removed Bloom and Grow Dimensional Rosette Dress in Pale Pink as a loved product.